It seems like just a few weeks ago; I watched the season 5 finale of Lost. It was only after the final LOST logo came on to the screen that the reality of a 9 month wait started to sink in. So, impatient as I was, I decided to speculate my way to a series conclusion. Because Lost is the best thing to happen to television since color. Lost is why cave-men painted shows on walls. Now I've had 9 months to speculate on these mysteries, and for the very same reason, this post will be massively spoilerful (unless I'm completely off the mark and even then). 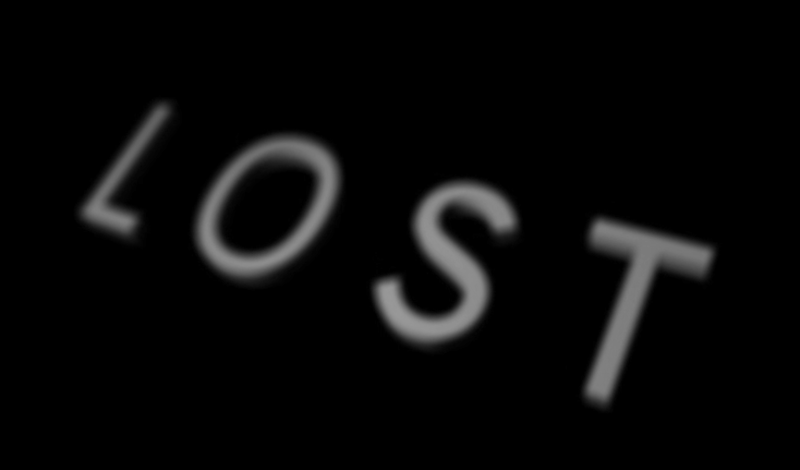 Do not read this post unless you have seen every available episode of Lost first. Otherwise, you'll be ruining a great experience for yourself. Warning! Don't ruin this for yourself. Still here? Okay, I trust you have, in fact, seen Lost. So read on. 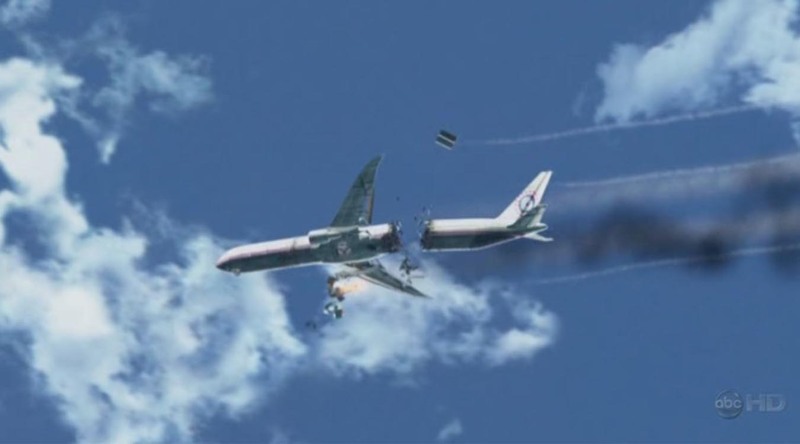 In the very first episode of Lost, we watch as a plane crashes on an island and how 48 survivors try to deal with the situation. By the end of the episode, to the sound of a monster rustling the leaves in the jungle, it is established that this is not a Robinson Crusoe show, it's a twilight-zone-esque science fiction mystery show. In a string of episodes throughout season 1 and most of season 2, it's established that each major character on the show somehow has events in their past from which they are running — stop running! Who hurt you, who hurt you? As each backstory unfolds, it also becomes clear that these characters share their backstory. One character will show up unexpectedly in the background of another characters past. Little tidbits here and there. 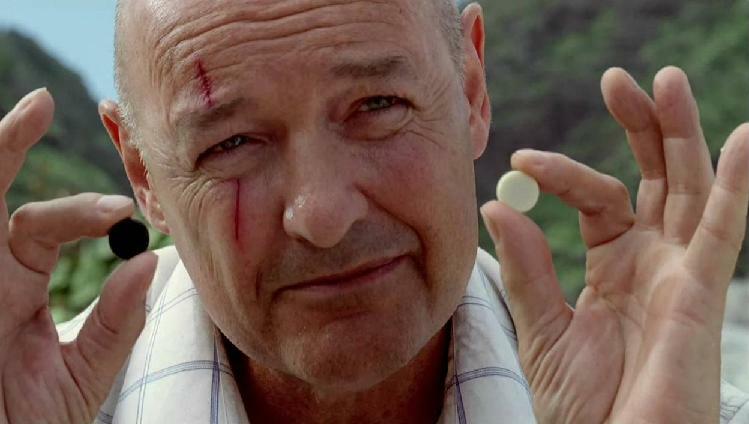 One gets the impression that there's a purpose to the plane-crash (other than "God works in mysterious ways") and a system as to who was on that plane; that somehow these characters are on this island for a reason. Of course this could just a framework for telling a number of compelling stories. But I'll bet you it's not. Only. The real attraction of the show is the island itself and the mythology that is established. Kate spots a horse from her past life, right in the middle of the jungle; Jack spots his dead father. Are these hallucinations? Or are they real, and if so, what's up with that? Throw in a plethora of Alice in Wonderland references, and I'll have to reiterate why this is the greatest show since sliced bread. So if Season 1 is the This Is A Character-Driven Mindfuck Show season, then Season 2 is the But Wait, There's More season. Season 3 is the There Are Others! season. Season 4 is the Stop The Island, I Want To Get Off season and finally season 5 is the Wait, I Want To Go Back To The Island, And In Time season. Hell yes. Are the only two words that come to mind. Like you could figure out Twilight Zone, sometimes, so can we figure out Lost. If we're clever. Here are attempted answers. Make a bingo plate for Tuesday, see if you can get 4 across. A: Why did the plane crash? The plane crashed due to an "incident", where Desmond — locked up in the hatch — forgot to push the button and inadvertently released all the electromagnetic energy stored in the islands underground. B: Why did Desmond push a button? The button activated a system which periodically released electromagnetic energy from a pocket underneath the island, which (as we learn in season 5) had become unstable due to drilling operations in the 1970ies. But why did he push it? Why wasn't this automated? Because the pushing of the button was also a "dead-man-switch". C: Why didn't anyone attempt a rescue mission? This Island Is Special. So Charles Widmore in an attempt at keeping the island hidden, orchestrated a lavish replica of the entire plane and its passengers. So that when the plane was found on the bottom of the ocean, everyone was assumed dead, eliminating the need to look. After its first introduction in episode 1, I thought I'd know what the monster was by episode 2 or possibly 3. 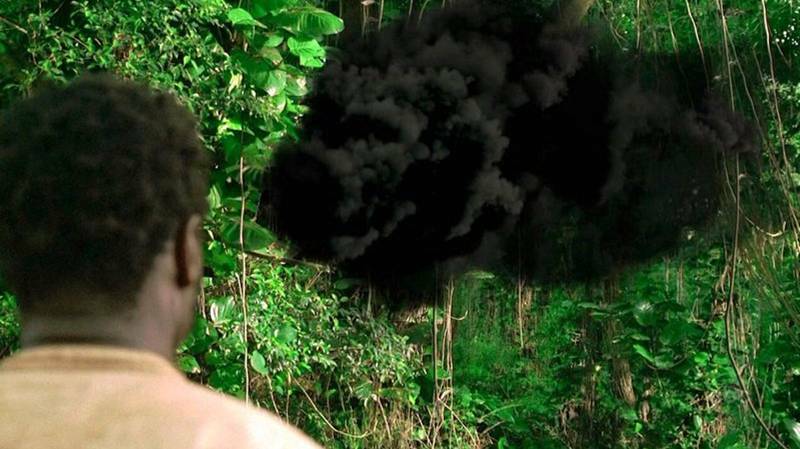 As it turns out, we had to wait until the middle of season 2 to find out that the leaf-rustling, tooting monster is a security system consisting of black smoke. On top of that, we had to wait until one of the last episodes of season 5 to find out that the smoke monster is related to the ancient egyptian-looking ruins and hence to the core mythology of the show, which'll no doubt be the core focus of the final season. E: What was up with the polar bear and the Dharma shark? As part of the Dharma initiative, a number of hatches were built on the islands (yes, plural). Some of the hatches dealt with psychological evaluations, some hatches dealt with biological experiments. One hatch experimented with animals, in this case polar bears and sharks. Polar bears, specifically, to investigate the effects of extreme acclimatisation; what happens when a polar bear is introduced in a subtropic environment. Since Dharma — as we learn in some episode — is on the island to change the world (for the better? 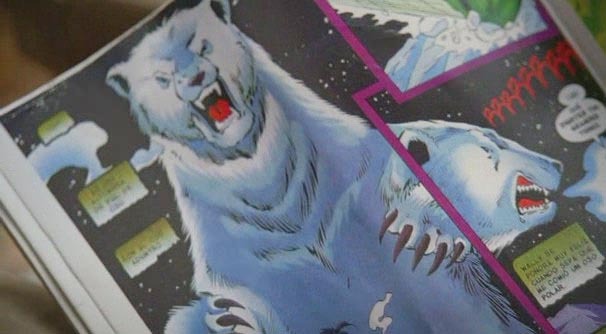 ), it's not unlikely that the polar bear experiment is an attempt at saving the species from the effects of global warming. The shark research is probably just another experiment, to which we won't get a specific answer. F: The statue! It had four toes! While one of the most delicious mindfucks of the entire show, I would reckon the answer is also one of the most disappointing. There really was no significance to the four toes. As it turns out, what we saw a four-toed foot of, used to be a giant statue of Tawaret, the egyptian goddess of fertility. It had four toes because accuracy wasn't very important in egyptian art; the rough rendition was all that mattered. 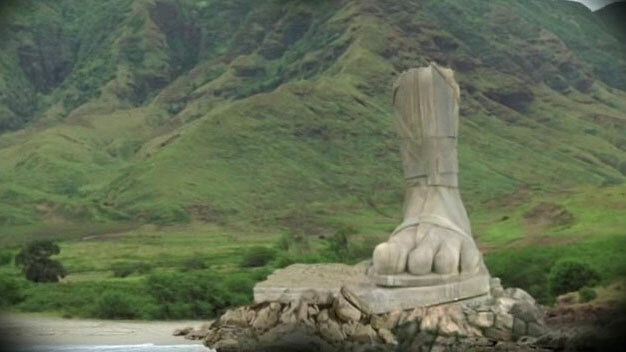 Four toes, five toes or six toes — it doesn't matter, as long as we can see who the statue depicts. Alas, no aliens or mutants were involved. Now the fact that it was an egyptian statue — that's of significance. Here's a list of the less certain stuff, which I expect to get answers to this last season. In fact, if I don't get some kind of answer to these things, I'll be writing a very angry letter to the producers. I may even send it! 1: What is the significance of the numbers? Hurley wins the lottery playing the numbers 4 8 15 16 23 42. Insane people claim the numbers are cursed. Desmond enters the sequence in the computer, releasing the electromagnetic energy. This is one of the questions I'm worried about; short of bending time and space, there's no way the writers can explain this one without invoking the classic Highlander 2 It's A Kind Of Magic phrase. I'm gonna expect them to go with the magic explanation, in some form or other: the numbers don't mean anything, per se, but the mystery character Jacob picked them and made sure things happened in relation to them. 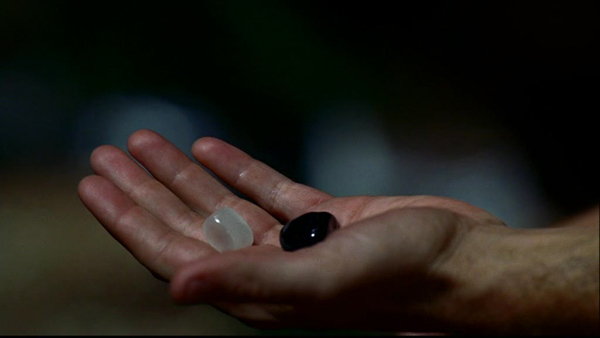 Jacob, unfortunately, has mystical powers, which is also how he brought the slave ship The Black Rock to the island as we see in the end of the last episode of season 5. 2: How do apparitions appear? Kate's horse, Jacks dad, Ekos brother, dead Charlie? While mostly used in season 1, I'm gonna go with The Monster on this one. As we've seen in a number of episodes (Juliette, Ben and Eko, notably), the monster seems to have the ability to "photograph" peoples memories. So why shouldn't it be able to project apparitions? Yeah, more magic egypto-mythology. 3: Time Travel? An island that moves? How? As we all know, matter attacts matter (gravity). Gravity may also be related to magnetism and electro magnetism. Einstein tells us that space can be bent and time can be slowed down in the presence of massive gravitational pulls. So I'm gonna say the time travel, the spinning record and the island moving, those things are both related to the massive amounts of electromagnetic energy present on the island. 4: What are the whispers in the forest? … someone said. I'm gonna group this with #2 and claim this to be an early monster warning. Something about photographed memories and apparitions in the form of sound. 5: What's the deal with the flaming arrows? Time travel. To the way way past. Roman galley past. 6: How old is Richard Alpert, and what's up with that? Really old. As old as Jacob and his nemesis. Which means statue-old. (See also, #5). 7: What's up with Jacobs list and sudden appearance to the heroes? So this is core to the end-game, game being the keyword you should take away from this presentation, the one bulletpoint to take note of. I want to say: Backgammon. I want to say black and white. So bringing our heroes who share backstory to the island, well that's part of Jacobs game. See also the grand unified theory later in this rant. 8: Is Locke special? Is Walt? Well Jacob certainly is. Richard Alpert certainly is. Is special something you can become, or were you born special? I'm gonna say, yes, Walt and Locke are special. In the way Jacob is special. Which I'm gonna say is related to that which I'm the most worried about come explanation day. I really hope it won't be "God did it", or "It's Magic". But I think it'll be some kind of "those special guys" have always been part of secret human history answer to this one. 9: Is Charlie alive when he appears to Hurley after he dies? Yes and no. It's Jacob or his nemesis, posing as Charlie. 10: What's up with fake Locke? See #9. It's Jacob or his nemesis. 11: What's the grand purpose of the smoke monster? If Richard Alpert is an adviser, a "make things happen" guy, the monster is the judge with the heart full of neutrality. In Jacobs and his nemesis' game of life — the game to see whether people can change or whether they always end up killing each other — the monster plays the judging part. 12: What's up with Dharma? Well somehow, probably by accident, a group of hippie visionaries found a way to the island and decided it was worth exploiting for the betterment of humanity. Perhaps them coming to the island is an earlier play by Jacob, to see whether man can change. Brought here by Jacob, some of them because they were "special". See #12. All part of Jacobs game. 14: How come Richard Alpert and Jacob are totally old? See #1. Which means: I doubt we'll get a pleasing answer to this one, other than "he's special". 15: What will happen if our heroes prevent the plane from crashing? In the recent season finale, our heroes — now stuck in the past — tried to prevent the incident from ever happening, thus preventing their arrival on the island altogether. In a cliffhanger / mindfuck of proportions, we are left wondering what's going to happen next. I predict we'll see an extremely liberal interpretation of the "many worlds" theory of parallel universes, combined with Terminator time travel rules. Which means, you can change the future. But not really. But yes, really. 16: Jacobs cabin, why is there gunpowder surrounding it? This is related to Jacobs nemesis' "loophole". The guy is clearly intent on killing Jacob (maybe he keeps losing in their backgammon-esque game of life, and he's tired of it?). In any case, gunpowder either keeps Jacob in, or the nemesis out. Who's the bad guy? 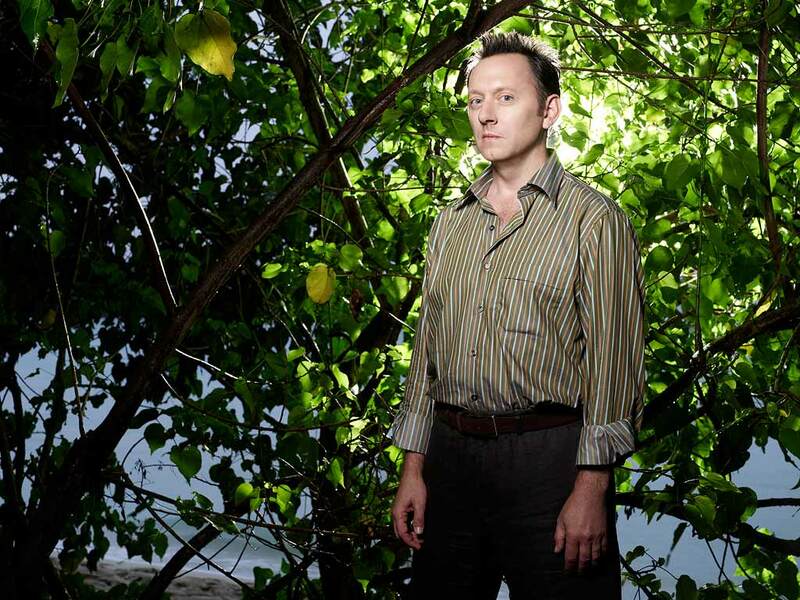 Charles Widmore, Benjamin Linus, or Someone Else? Jacobs nemesis. Charles Widmore is just a pawn illustrating that "people always end up killing eachother". Backgammon is the oldest game in the world. Two players. Two sides. One is light, one is dark. People get to the island for a reason. They are lost (pun so intended) and they are given a second chance. Jacob brings them here, and he's done so for decades, maybe centuries. Maybe even millenia. All part of a grand game he plays with his nemesis in black. The purpose of the game is to find out whether, if given a second chance, people are willing to change or not. Whether they will accept redemption and forgiveness if it stares them in the face. Jacob believes, Evil-Man-In-Black does not. Time travel is just a metaphor for "second chance"; if you could change the course of your own history, would you? Or should you accept that you are the sum of your experiences? We'll find out wednesday; who will undo their past five years, who will embrace them. Nemesis: They come. They fight. They destroy. They corrupt. It always ends the same. The evolution of civilization can be compared to a waltz. Two steps forward, one step back. Jacob believes that with all our flaws, us mortals will eventually do what's right; improve — move forward, find our way. So who are these two beings? What are they doing on the island? How long have they been doing it, and why oh why? On one hand, they're doing it to bring us six seasons of awesome television. On the other hand, we have the key to the show. Which in the grand scheme — the "wrapping things up with a nice bow" sense — is what season 6 will be about. Forget electromagnetism. Forget time travel. Forget polar-bears, sharks and daddy issues. The real question Jacob and Man In Black has been fighting over since we worshipped celestial bodies and cut hieroglyphs in to walls is this: can we improve or not? I think I've met Jacobs nemesis on several occasions. He's called the pessimist, and he believes the world will end and that things are getting worse, not better. I'm totally with Jacob. Even if he is related to fairies, unicorns and Ramirez from Highlander 2. Excellent recap. My only question is, Highlander II the theatrical release where they’re from the planet Zeist of Highlander II the director’s cut version where they’re from the past? Well that’s embarrassing. I’m obviously behind on my Highlander canon. I’m referring to how Ramirez is back in 2, though he clearly died in 1. So the man in white is the good guy, and the man in black is the bad guy? Can it really be that simple? Gotta say, up to episode 9 now, and you were pretty much on the money with most of what you said. Hats off to you sir. Much appreciated. I’ve put a lot of thought in to it. That said, I was off the mark with the smoke monster being a judge of sorts.